Tilt your device to drag your car wherever you want, overtake traffic. You drive your car in cockpit view through the endless traffic and realistic environment. Monster Truck Speed is the best mobile racing game you have been looking for. Amazing addicting monster truck speed game with HD graphics. Cross all the obstacles to get the finishing level. Game has infinitely many levels built randomly. Enjoy! 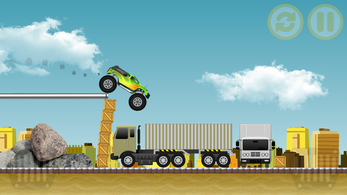 Avoid all the obstacles on your way, control your Monster Truck with physics because trucks bounce, drift and slips like real tire driving! - Real physics realistic game, realistic vehicle and real fun!